From the kitchen of One Perfect Bite...Like many small families we eat a lot of chicken and pork. They make it possible for us to have meals that can be eaten in one sitting without having to deal with leftovers. For years after the children were on their own, I'd use pork tenderloin because it was fast to make and always tender. We love pork chops, but cooking them properly and serving them before they become shoe leather isn't always easy. More often than not, they need to be brined to keep them moist and tender as they cook. While doing some reading in preparation for our, now completed, trip to China, I came across a recipe from Taiwan that used thin cut pork chops. I thought the recipe was worth a try and we've been delighted with the results ever since. 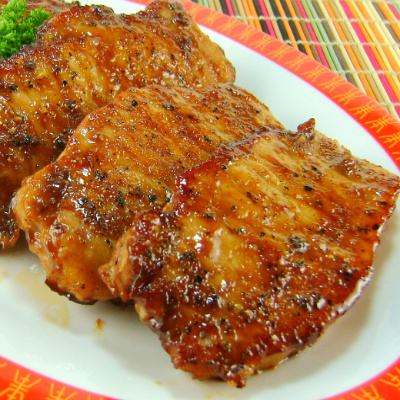 If you like, a reduced sodium soy sauce or tamari can be used to marinate the chops. The chops should be no thicker than 3/8 of an inch. If yours are more than that, beat them to submission. While the marinade can be made in less than 5 minutes, the chops should laze in it for at least an hour before they're are cooked. Total cooking time is less than 5 minutes and, be forewarned, the chops will toughen if they are overcooked. I serve these right from the pan with scallion rice and a bean sprout salad. I know you're going to love these. Here's the recipe. 1) Combine soy sauce, cornstarch, pepper, sugar and salt in bottom of 9 x 13 x 2-inch baking pan. Stir with a fork until all ingredients are combined and marinade is smooth. Add chops, turning to coat both sides. Cover dish with plastic wrap. Refrigerate, turning occasionally, for 1 to 24 hours. 2) Heat oil in a large frying pan set over medium high heat. Add pork, working in batches if necessary. Cook 1 to 2 minutes per side, until golden brown and cooked through. Transfer to serving plate or serve from pan. Yield: 4 servings. I'm not sure where in china you will be going...but I do hope you have as much fun as we had when we took our oriental tour vacation. The chops look scrumptious!...One more reason to yearn to have a warm day...! Muse, we loved China, earthquake and all. We are still trying to get to Tibet. Each time we've planned it there have been travel advisories for Westerners and despite our pleas it was a no go. This seems like the perfect dish for our family! I love the sound of these, so simple but awesome. I bet they're great with the soy sauce! What gorgeous color! And with only an hour of marinating, I don't need to have a lot of forethought to do these! These are some gorgeous pork chops! I also overcook pork chops - in my diligence to make sure they are properly cooked. I like the idea of marinating and I love the flavors. I love Asian marinade on chops. We had pork tenderloin for dinner. Yummm... what a yummy pork chops! Mary, the chops look delicious! and we will definitely try these. I hope the shoulder is doing well. These look gorgeous Mary. My husband adores pork chops and anything with the flavor of soy sauce. I am bookmarking this to make for him. Thanks. The chops look glossy and beautiful. Sometimes the simplest ingredients are the best. I also overcook chops....and I thought I was the only one! I've eaten this before! My mom learned from a Taiwanese friend. But it wasn't with pork chops...it was with some kind of other meat I totally forgot. Hee hee. The pork chops looks simple enough to make for a busy day. Thank you for sharing, Mary. I am going to have to try these. I have discovered I prefer to eat pretty much only pork and chicken anymore, but am guilty of overcooking pork way too often. I love, love, love to eat pork cooked or barbecued just right. Thank-you. These chops looks so moist and delicious. I'm always on the lookout for recipes that can be prepared for one. This is perfect, Mary. Thanks. I use a lot of chicken and pork as well Mary...These look fabulous...sometimes the simplicity of ingredients can really surprise you. These pork chops look irresistibly good. Love the colour. We are also big on chicken and pork it's just me and my hubby so that's always the easy thing. These look great! Thanks for stopping by my blog!! This is so yummy! My mom used to make this when I'm back home. I'm just dying to try these pork chops. They look soooo good! This pork dish looks delicious. So perfectly prepared; I should make greater use of pork for weeknight meals. Thank you so much for sharing your family favorite so that I can make it a favorite here as well. I got your recipe off Pinterest and made these today. My family is raving over the taste. They absolutely love love love, the marinade is the best ever ! They all want your recipe. Cindy, from New Orleans. Made these and loved them! Making them again for the second time, thanks for the great recipe!! I tried the recipe last night, it tasted ok, but it would've been better if I knew what I was doing. For some reason my coating/marinate was mostly stuck to the bottom of the pan, any idea why? I found your recipe a couple of months ago on Pinterest, and it's become a regular in our rotation. I usually add a little bit (1-2 tsp) of sesame oil to the marinade. Love this one! Thanks for sharing! What if I dont have cornstarch? What can I substitute? Would love to make these tonight. Erica, you can use arrowroot or flour. Oh, so good! I had to cook them a bit longer than suggested ~4min/side, but maybe they were thicker than 3/8" My husband doesn't like pork chops much, but he loved these. Thank you for this recipe! I cut up part of a pork loin into bite size strips as an appetizer and marinated overnight. This was a big hit! Absolutely delicious. This was beyond AWESOME!! I had almost given up hope of making a moist pork chop and you have absolutely changed that for me. Thank you for sharing such a FAB recipe! I tried this tonight. I think next time I will cut out the salt, I thought the soy sauce and salt together was unnecessarily salty. Though I liked the rest of the flavor a lot so I will probably try this again. I love super simple recipes like this that actually have flavor! This has become a weekly staple at my house. I buy the super skinny boneless (or bone-in) pork chops. Marinate all day in a bag. Pan fry 1-2 mins per side. So delicious. Great carmelization. I forgot about these chops. My husband loves pork chops and I know he will love these as well. I did make these before but I have forgotten the taste because it was a few years back. I hate pork chops... but LOVED these! I will for sure be making them again!